Schaub set multiple school passing records in college and was the ACC Player of the Year in 2002. He was chosen by the Atlanta Falcons in the third round of the ’04 NFL draft and backed up Michael Vick for three seasons. Schaub started two games and showed enough promise to attract the attention of other teams. He was traded to the Texans in 2007 and moved into the starting lineup. With a strong and accurate arm, he played well when healthy, but injuries kept him out of ten games in his first two years with the team, and he was prone to fumbles and interceptions. Still, he completed 66.1 percent of his passes in 2008 for 3043 yards and 15 touchdowns with 10 interceptions. Texans went 9-7 to finish second in the AFC South, the first winning record in franchise history, while leading the NFL in passing yards (4654). 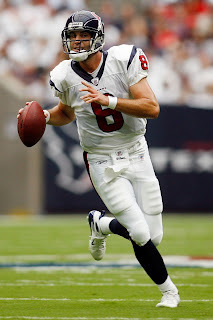 Schaub again started every game in 2010 and passed for 4370 yards and 24 TDs with a passer rating of 92.0 while his interceptions dropped to 12. Both he and the team were off to a good start in ’11 before a foot injury knocked him out for the last six games of the regular season as well as the club’s first postseason appearance. Schaub returned in 2012 and had a Pro Bowl year as he passed for 4008 yards and 22 TDs and won in his first playoff appearance. However, he had a disastrous year in 2013, throwing for more interceptions (14) than touchdowns (10) and he was benched, leading to his being traded to Oakland in the offseason. He saw scant action as a backup to Derek Carr, was released, and signed with the Baltimore Ravens for 2015. Through 2014, Schaub has passed for 24,311 yards and 130 touchdowns, giving up 86 interceptions, with a 63.9 completion percentage and 89.5 passer rating. Of those totals, 23,221 yards with 124 TD passes and 78 INTs with a completion percentage of 64.6 and passer rating of 90.9 came during his seven years with Houston. He has been named to the Pro Bowl twice.